LONG TERM LEASE (12+ Month) INCENTIVE!!! Receive 50$ Off Per Month!!! Gorgeous Downtown Condo High-rise Building! Excellent View of Downtown Core from Unit! 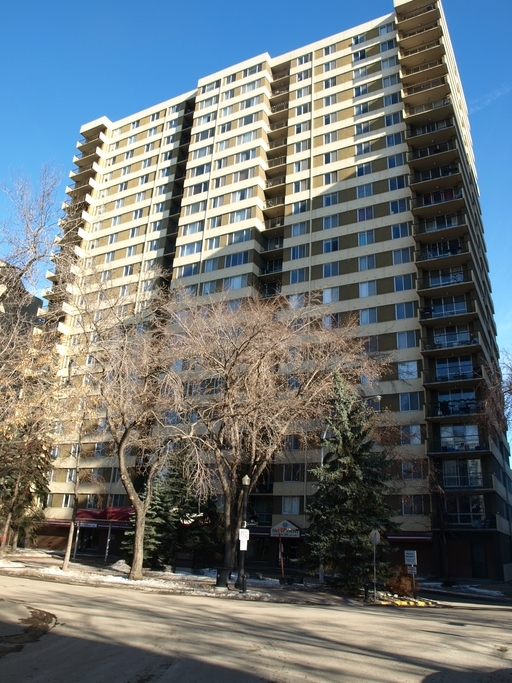 Close proximity to both River Valley and Famous Jasper Ave! This updated modern unit features stunning flooring throughout, a large living room, complete with a modern couch with chase, two accent chairs and a large area rug. Not to mention a fully decorated entertainment stand with massive flat screen TV! There is a large dining room with a vintage overhanging light and plenty of space to entertain. With the large patio doors that lead to a good size balcony overlooking the downtown core, and the large window in the dining room, this unit is filled with tons of natural light! The kitchen features modern cupboards, and upgraded counter tops, not to mention the large dual basin sink with extendable tap, the large fridge, stove with hood range fan and dishwasher! The cupboard are full of the essentials and more! Including Bosch Tassimo coffee maker, magic bullet blender set, and more! There is a large front hall closet, a storage room complete with vacuum and various other items for your use, and linen closet! Never run out of storage space! The bathroom is quite expansive and has a large vanity and hanging shelf unit, beautiful tile flooring, as well as a tub shower! Stocked fully with towels down to toilet paper! The large bedroom has a massive closet, huge queen size bed with modern comforter and night stand. The bed frame even has storage drawers. The view from the window the entire downtown core! Amazing! The building features amenities such as a large indoor pool, a work out facility/gym and a sauna room. Plus a recreation room with a pool table and much more! There is laundry on ever floor operating with the easy to use smart card systems. One above ground reserved stall is included. Plus heat, water and power are included in the rent price! Don't miss out on this great building! Call for a viewing today!